Make a whimsical Victorian ornament. This whimsical Victorian ornament is an authentic reprint of an 1800s design provided by Godey’s Lady’s Book, a nineteenth century ladies’ magazine. 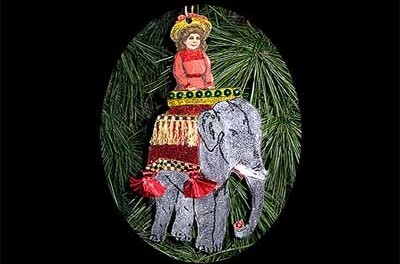 The printed design for the elephant was hand-colored and decorated with glitter, embroidered ribbon, green beads, silk fringe and red tassels. Make your own authentic Victorian Christmas tree ornament! Read full story. An attractive Christmas gift is a basket or box filled with homemade cakes and candies. This letter had in it so much sympathy and thought that it has been printed again and again. Victoriana Magazine wishes you a happy holiday season! Authentic London street scenes, period music, theatre, dancing, and sumptuous feasting and shopping.